PUPILS LOOK UP WORDS IN A THESAURUS TO CREATE A WORD BANK THAT THEY CAN USE TO WRITE AN INTERESTING LETTER OF COMPLAINT. 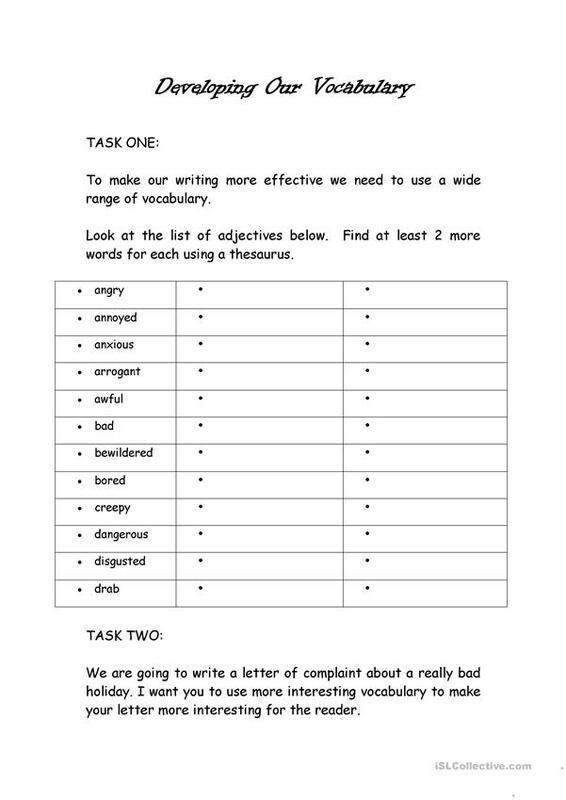 The above downloadable handout is intended for elementary school students at Pre-intermediate (A2) level. It is excellent for strengthening your students' Writing skills. Nichola is from/lives in United Kingdom and has been a member of iSLCollective since 2012-03-30 12:37:15. Nichola last logged in on 2012-04-02 16:30:00, and has shared 1 resources on iSLCollective so far.